This is one in a series of mailers finding their way to voters in the 57th House District, where Republican state Rep. Nancy Jenkins is running for re-election against former Democratic state Sen. Jim Berryman. Questionable statement: "As a state senator, Jim Berryman was caught in a double dipping scheme for his travel reimbursements. Berryman ripped off the state's taxpayers and cost us more money." For many years, Michigan legislators were permitted to create and use Officeholder Expense Funds to pay for costs incidental to holding office. Some lawmakers, including Berryman, used the funds to lease cars. In addition, lawmakers are permitted to claim a mileage reimbursement for one round trip each week for travel between their district and the Capitol. Berryman did that as well. Republicans claimed during Berryman's 1994 reelection campaign that this was double dipping. They are repeating the claim now. Berryman told LensConnect.com that Senate officials looked into the complaint and never asked him to make a reimbursement. The current Secretary of the Senate, Carole Viventi, wasn't there at the time and says she isn't sure a paper trail would even exist. But she said it doesn't seem to her that the mileage reimbursements would have been inappropriate. "The mileage is to pay for gas to and from the district. It wouldn't matter to us if you owned the car," she said. "If it was your best friend's car, we wouldn't care." Questionable statement: "As a lobbyist, Berryman lobbied for a school employee who was arrested for drunk driving and failed to report it to the school district within the timeframe required by state law." For starters, Berryman is not a lobbyist, according to a check of the Secretary of State lobbyist database. According to an article in the Adrian Telegram's website lensconnect.com, he was a local director for the Michigan Education Association, and he was assigned to represent a 20-year employee who was being terminated for failing to report the drunk driving charge within five days. The employee was entitled to representation, and it was Berryman's job to represent him. As it turned out, an arbitrator ruled that termination was excessive and reinstated him in his job, according to the article. Foul or no foul: Flagrant foul. Berryman is not a lobbyist. Words such as "caught" and "ripped off" imply criminal activity, yet the mailer provides no evidence of an arrest for criminal activity, much less a conviction. Questionable statement: "No gimmicks. That's the pledge Nancy made when she said she'd balance the budget, and Nancy helped balance the budget for the first time in nearly a decade. 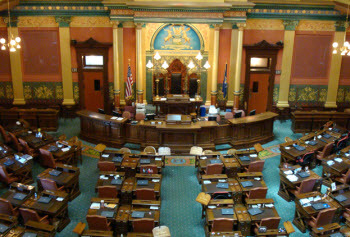 Even better, Michigan now has a budget surplus." Article V, Section 18 of the Michigan Constitution requires the governor and the Legislature to balance the budget, and in fact they have been doing it. While the state has faced prospective budget deficits during the course of a fiscal year, it has almost always closed the books with a positive fund balance, said Ellen Jeffries, director of the Senate Fiscal Agency. It certainly is true that Michigan moved from budget crisis to budget crisis for a decade or more, sometimes relying on one-time fixes or accounting maneuvers to balance the books, which are sometimes referred to as gimmicks. The budget is much more structurally sound today, although one person's gimmick is another person's smart strategy. The political process has been much smoother in the past two years. Jenkins voted with the Republican majority on the state budget and school aid budget. The budget was balanced, and the state is expected to end the 2012 fiscal year with about $365 million in the rainy day fund. Questionable statement: "Voted to save taxpayers $1 billion over the next three years." The mailer cites two pieces of legislation. House Bill 5699 moved up a reduction in the Michigan income tax (from 4.35 percent to 4.25 percent) by three months, from Jan. 1, 2013 to Oct. 1, 2012. It passed the Legislature and was signed into law. According to a Senate Fiscal Agency analysis, that bill and another one increasing the personal exemption will save taxpayers about $170 million over three years. Here is the analysis. Jenkins sponsored and voted for the other cited measure, House Bill 5729, which would have made additional income tax cuts. Taxpayers would have saved about $930 million between fiscal 2014 and fiscal 2016. Here is the House Fiscal Agency analysis. It passed the House, but has not been taken up in the Senate. So while the claim is truthful, a casual reader might conclude that the savings were a reality. Foul or no foul: Foul. The state budget is balanced every year. Jenkins’ mailer leads the reader to believe otherwise. Questionable statement: "Nancy championed legislation to reduce burdensome job-killing regulations on the agricultural industry." Jenkins voted for Senate Bill 122 and House Bill 5717, which, among other things, would protect farmers who participate in the Michigan Agricultural Environment Assurance Program from civil fines if they report discharges into waterways promptly and take corrective action. The bills were passed with strong bipartisan support, 83-25 and 91-18, respectively, and were signed into law. The voluntary program is designed to promote effective stewardship of the land. Foul or no foul: No foul. Jenkins was part of large majorities in favor of regulatory changes on agriculture. Questionable statement: "In a recent ‘tele-town hall,’ Rep. Jenkins misled the public on her voting record, saying she supports rights for working families and has not voted to limit collective bargaining in any way. Working families in Lenawee know a different story — the fact is, she has continuously voted to drastically reduce and eliminate collective bargaining rights for working families. Listen here, in her own words:"
"Well, I think unions certainly have a place and they are important to ensuring that teachers, and all workers, have a very good place to work, and they are good working conditions, and that sort of thing. Collective bargaining, I know there's a lot of concern that we are going to be limiting collective bargaining. "The bills that we have passed over the last year and a half, we have been very careful not to eliminate collective bargaining in the state, and instead if there are going to be some changes made in a law or something, we said that those changes couldn't be made until the contract expired and then new collective bargaining would take place under the new rules that were established under the law. (bold italics added) We are very careful about maintaining collective bargaining rights because I think that is something important to union members and it's something that we need to ensure that those are protected." Contrary to what Berryman's website says about Jenkins claiming she has "not voted to limit collective bargaining in any way," Jenkins acknowledges in the audio clip that legislators have been voting on laws that change collective bargaining rights in Michigan. The points she seems to be making are (1) lawmakers are preserving the basic right to collective bargaining, but (2) changing the rules, effective once contracts expire. But there's nothing that explicitly puts the provisions on hold until contracts expire, and in at least one case, a school district has moved forward to take actions in conflict with its contract. The Troy School Board approved a plan moving teachers (allowed under House Bill 4628) in June that ignored the seniority provisions in a contract that doesn't expire until 2013. Here is a C&G Newspaper article on the controversy. Foul or no foul: Technical foul. This is a thicket of semantics. Jenkins, in the transcript, is arguing that the right to collectively bargain has not been changed. Berryman is arguing that how the right to collectively bargain is regulated has been changed, therefore Jenkins' position is inaccurate. Berryman's statement, relying as it does on the transcript above, skews what Jenkins said. The claim's reliance on the particular statement leads to the technical foul. Questionable statement: "Jim Berryman supports a government-run health care system that goes further than Obamacare. This cuts Medicare funding over $700 billion, hurting Michigan's seniors. The Berryman plan also includes $810 billion in taxes on families and small children. " Berryman responded to the Political Courage Test of the nonpartisan group Project Vote Smart, which collects and disseminates candidate information on a range of political issues. "k) Provide citizens age 55-65 the option of purchasing Medicare health coverage. The $700 billion figure is the rounding of the $716 billion cut that Republican presidential candidate Mitt Romney says President Obama would impose on Medicare. That claim was ruled half true by Politifact.com, and criticized by FactCheck.org. But it has nothing to do with this state House campaign. Similarly, the $810 billion relates to Republicans' analysis of Obamacare. Foul or no foul: Foul. The $716 billion figure is for reducing payments to health providers over several years, not cutting money from current seniors. Questionable statement: "Berryman supports reversing the state's new $350 million tax on seniors' retirement — costing seniors an extra $3,000 at tax time every year." Gov. Rick Snyder and the Republican-controlled Legislature removed exemptions on the state income tax for pension incomes, though the changes are phased in by age. Berryman, like most Democrats in the Legislature, is opposed, saying it put an undue burden on seniors. A July 2011 analysis by the House Fiscal Agency lists the expected revenue from changes to the income tax exemptions on pensions to be $343 million in the current fiscal year. AARP Michigan typically says seniors will pay hundreds of dollars more in taxes, according to spokesman Mark Hornbeck. According to AARP, the 480,000 seniors born before 1946 will be exempt from the pension changes. Questionable statement: "Lansing passed a new $400 million tax on every health care claim we make — from urgent care to filling prescriptions. Berryman opposes this tax and has a plan to reverse it, make sure seniors can afford the health care they need." The Legislature enacted the tax to replace revenue from a tax on Medicaid managed care services. You can see a brief Center for Michigan synopsis here. The change in taxes was made to ensure that the state would be eligible for federal matching funds. Simply eliminating the tax on health care claims would create a $400 million hole in the budget for health care, and even more if the federal funding were lost. If he has a plan to reverse it, he hasn't spelled it out on his website. Foul or no foul: Foul. Not all seniors face a $3,000 higher tax bill due to the income tax changes. And the ad doesn’t explain how reducing the state’s funds for health care "make sure seniors can afford the health care they need." Questionable statement: "Berryman has a plan to repeal the $1.4 billion middle-class tax increase. Berryman believes it's wrong for Lansing to ask more of middle-class families while giving tax breaks to CEOs and corporate special interests." In essence, Berryman appears to be advocating a repeal of the tax reform package approved by Republicans. The plan most notably dramatically cut business taxes while increasing the burden on individual filers. Foul or no foul: No foul. The state tax burden has shifted to individual filers, plenty of whom would be "middle class." Tax breaks have been given to business interests.